This is a Sponsored Post written by me on behalf of McCormick Flavor Forecast 2012. All opinions are 100% mine. From the kitchen of One Perfect Bite...My pantry is packed with ingredients that I use for making family meals. While I'm willing to experiment, I don't take a lot of chances with the elements that I use in my cooking. I need to know that everything I add to a dish will perform consistently each time it is used, and I have, for years, had consistently good results with McCormick herbs and spices. Just last week, McCormick released its Flavor Forecast for 2012 and I've been busy reading and cooking my way through the publication in order to determine the trends and flavors that will be popular in the coming year. I've focused on those that I know my family will like. In the past, these forecast have been regional, but this year McCormick expanded its scope and gave us its first-ever Global Flavor Forecast, effectively giving us the world to work with. I would love to test everything I've found, but time forces me to be more selective, so I put together a theme meal that spans several of the trends and uses flavor combinations that work well with dishes within the theme. Warmth is much appreciated at this time of year, so I decided to piece together a meal with decidedly Latin flavors. Almond and Date Bulgur Salad with Sofrito...I wanted to start the meal with a salad that could be made well-ahead of serving. I found one that looked delicious in the trend called Honoring Roots. The recipe that caught my eye paired cumin with sofrito and gave a new twist to a familiar tabbouleh salad. Everyone is familiar with sofrito, the Latin flavor base that's made with a sauteed mixture of aromatic vegetables. 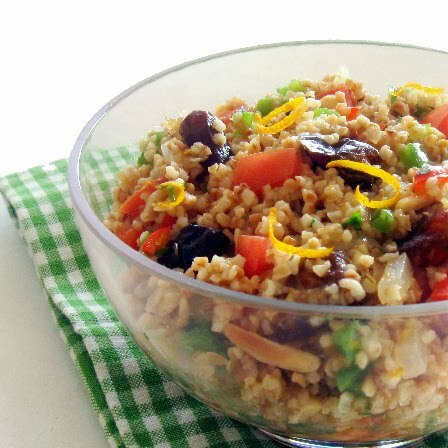 Here the mix of peppers, onions, tomatoes and garlic is used to season a cracked wheat salad that is usually associated with the Middle East. A real fusion occurs when those Latin flavors are paired with the orange, date , cumin and almond that are more typical of the Middle East. In true global fashion, what was old has been made new again, and I'm using this new interpretation of tabbouleh to start my Latin meal. Be sure to season to taste with salt and pepper before serving. You can find the recipe here. Cuban Grilled Chicken with Salsa Fresca...The main course for my dinner comes from the trend called Flavorful Swaps. 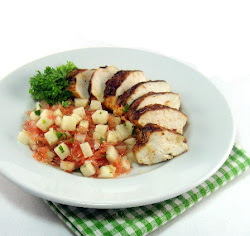 The recipe is for a marinated grilled chicken that is served with an unusual salsa fresca. The marinade is made with grapefruit and red pepper and they replace the citrus that's usually found in mojo marinades. That swap, in combination with other herbs and spices, delivers a sauce with bright bold flavors and it uses less salt and fat than would be typically be the case. The combination also promises metabolism-boosting benefits. I'd suggest you let the chicken marinate for 6 to 8 hours for maximum flavor penetration. One of the highlights of this entrée is the lovely salsa fresca that accompanies it. It contains jicama for texture, jalapeño for heat and grapefruit for brightness. Be sure to set aside some grapefruit segments when you make the salsa fresca. The grapefruit disintegrates as the salsa sits and it is nice to have some eye-appealing chunks to add just before serving. This is simple, easy and delicious entrée. You can find the recipe here. Coconut Ice Cream...No meal would be complete with something sweet to end it. The trend Simplicity Shines, uses two flavor profiles for the dishes that it features. The first pairing is ginger and coconut. 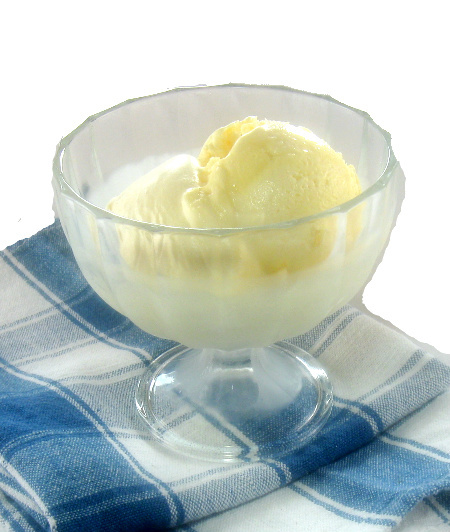 The second is vanilla and butter. I put the pairings to good use in the two recipes I used to make the dessert that ended my meal with a Latin flair. My ice cream maker stands at the ready regardless of weather, so I used it to try the coconut ice cream that I found tucked within the recipe you can find here. This ice cream is outstanding. 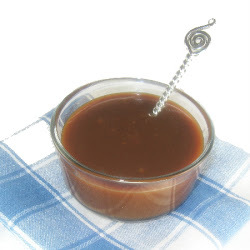 Easy Butter Toffee Sauce...While no topping was really necessary for the coconut ice cream, this was a special meal so I decided to try this decadent butter sauce to go with it. This is one of the easiest recipes I've come across for a caramel-type sauce and I think you'll really enjoy it. When liquid hits the sugar syrup this will foam furiously, so be prepared to stand back and stir with a long-handled spoon. This is a wonderful ice cream topper. The recipe for this buttery-flavored sauce can be found here. 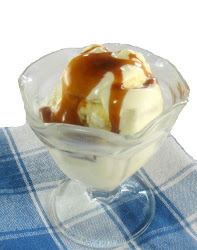 A Hot Toffee and Coconut Ice Cream Sundae...It's time for some Flavor Forecast algebra. When A + B = C this is what you get. I think you'll love the value of C.
The coconut ice-cream with the toffee sauce looks wonderful! That is my favorite. That almond and date bulgur looks so tempting! The Cuban Grilled Chicken and the Ice Cream and Sauce all look delicious!! I love cuban food. I sometimes do a black beans and rice salad that is from my cuban cookbook - so yummy! I would love to try that chicken! I just know I would be so stuffed after eating this meal...because I would eat it it - and probably go back for seconds!! What a fantastic post; I am true foodie and have never heard of sofrito; I really want to try this one. Coconut ice cream... I'm having a huge rave for ice cream, right now! 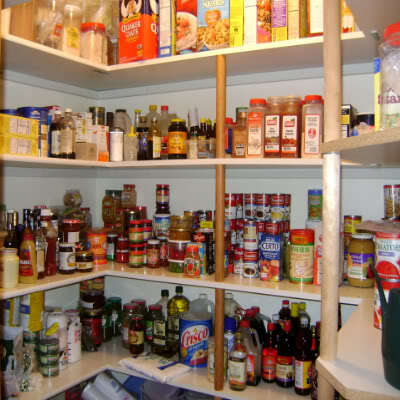 I love your pantry! And the coconut ice cream looks delicious! I give you credit for staying focused with your new project, I always find something that I just have to make and off on a tangent I go. I am jealous the Silver Fox will try all these new flavors. Unless the grapefruit/orange juice is partnered with vodka, hubby won't go near it and I happen to LOVE all citrus. Best way to boost up the downs of foods effect on your metabolism. Look forward to more creations. The Cuban Chicken looks/sounds great! I use Cumin in a marinade for chicken breasts, but have never added grapefruit juice. That sounds tangy! Yum! Your projects truly fascinate. I'd love to be a taste-tester in your household. The salad is truly calling to me (all right the chicken is also) and while experiment when the temps climb above zero. Right now all I want is mashed potatoes and gravy! Everything looks wonderful! Great meal! I love the flavors in the forcast and had fun experimenting in the kitchen myself this week. Some of these flavor combos sound so intriguing to me! And coconut ice cream...I'm hooked. Just stopping by to say hi and see what you're up to! And Mary, what I wouldn't give for your pantry! Your recipes listed sound delicious, but I WANT YOUR PANTRY! LOL! My husband with love the bulgar salad. Anything with a sofrito and he's thankful, thankful, thankful. Oh wow, thanks for sharing all info.